According to their data, 430 openly LGBTQ candidates this year have run for office at every level of government. Many say they've been pushed off the sidelines, fearing their rights are under attack. Three years after the Supreme Court legalized gay marriage, they now see the Trump administration working to bar transgender people from serving in the military and promoting religious freedom laws the LGBTQ community says would legalize discrimination. Currently, there are only six out LGBTQ House members and only one lesbian senator, Wisconsin's Tammy Baldwin who's running for re-election. Baldwin could be joined by Arizona Rep. Kyrsten Sinema, who's bisexual and just won the Democratic nomination for Senate in one of the most competitive races this year. One of those candidates is Angie Craig, running in Minnesota's 2nd District in the suburbs of the Twin Cities against GOP Rep. Jason Lewis, who she lost narrowly to in 2016. If elected, Craig would be the first LGBTQ mom ever to serve in Congress, and her campaign ads feature her wife, Cheryl, and their four sons. "I'm not running because I would be the first lesbian mom, but that's pretty cool I would be," Craig told NPR in an interview. Craig's journey to become a mom is part of what drove her to run for office. When she and her then-partner were living in Tennessee and decided to adopt a baby, she was caught in a three year legal battle after the birth mother's parents sued to challenge their fitness to raise a child. Today, her son Josh is 20. "It probably is the thing that has shaped my life the most," Craig said. "When you get up every single day for news and you don't know whether you're going to be able to put your son to bed that night. Certainly it makes you unafraid of anything and I think, you know I when I'm running for Congress I always remember no matter how tough it gets it'll never be anything more difficult than what I faced back in Tennessee." That theme of struggle is something other LGBTQ candidates have cited as reasons why they're running this year. Christine Hallquist made history when she won the Democratic gubernatorial nomination in Vermont. She's the first transgender person ever to win a major party's nomination for governor. Hallquist is one of four LGBT Democratic nominees for governor running this cycle — in fact, they represent every part of that acronym. Lupe Valdez in Texas is lesbian, Rep. Jared Polis in Colorado is gay and incumbent Oregon Governor Kate Brown — the first openly LBGTQ person ever to win a governor's race — is bisexual. In an interview with Morning Edition after her victory, Hallquist recalled how difficult her transition had already been — harder than anything she might face in the campaign or if she is elected governor. "I dealt with not being authentic my whole life," she told NPR's David Greene. "And now that I'm through it and looking back, you know, it's a joy to be where I am today. But it's really hard for folks. And transitioning was clearly the hardest thing that I could ever imagine doing." Other candidates, like Rufus Gifford, who is running on Tuesday in a crowded Democratic primary for an open seat in Massachusetts's 3rd District, talk about the discrimination he faced after coming out as gay. Gifford served as U.S. ambassador to Denmark under President Obama, but the 2016 election aftermath spurred him to put his own name on the ballot. He remembers watching other people run for office when he was a teenager, but there weren't role models for him as he was struggling with his sexuality, something he talks candidly about in a TV ad. "I hope that sometimes, just by being open and smiling and talking about my life now, that 15-year old version of me may just have a glimmer of hope," Gifford told NPR. "I just think that that's incredibly impactful and matters. I know it would have mattered to me. I would have loved to have seen that. They could have changed my life in a lot of ways." Democrats have a lot of diverse candidates running this year. There's a record number of women, African-Americans and Native Americans running in some high-profile races. And as NPR's Jessica Taylor reports, there's also a surge of lesbian, gay, bisexual and transgender candidates all across the country. JESSICA TAYLOR, BYLINE: Massachusetts Democratic congressional candidate Rufus Gifford recalls watching other people run for office when he was a teenager, and there weren't role models for him as he was struggling with his sexuality. It's something he talks candidly about in one of his TV ads. RUFUS GIFFORD: As someone who has been called names, has been discriminated against, as someone who wasn't taken seriously for a lot of his life because of this, it made me initially want to fight for the 15-year-old version of me. TAYLOR: Gifford is running today in a crowded primary for an open seat in Massachusetts' 3rd District. He's a former U.S. ambassador to Denmark under President Obama, but the 2016 elections spurred him to step up and put his own name on the ballot. GIFFORD: The Trump election was really the catalyst. TAYLOR: Gifford is one of hundreds of LGBTQ candidates on the ballot this year who say they've been pushed off the sidelines, fearing their rights are under attack. Three years after the Supreme Court legalized gay marriage, they now see the Trump administration working to bar transgender people from serving in the military and promoting religious freedom laws they say would legalize discrimination. There have been 430 LGBTQ candidates this year running for office at every level of government. That's according to the Victory Fund, which endorses viable gay and transgender candidates. ANNISE PARKER: I think candidates are running because they see it's possible. TAYLOR: Annise Parker is the Fund's president. She was also the first lesbian mayor of a major U.S. city when she was elected Houston's mayor in 2009. PARKER: They see the need for more LGBTQ candidates to get involved in the process. But they now see clear evidence that we can win at the very highest levels of government. TAYLOR: Tammy Baldwin of Wisconsin was the first elected lesbian senator, and she's up for re-election this year. 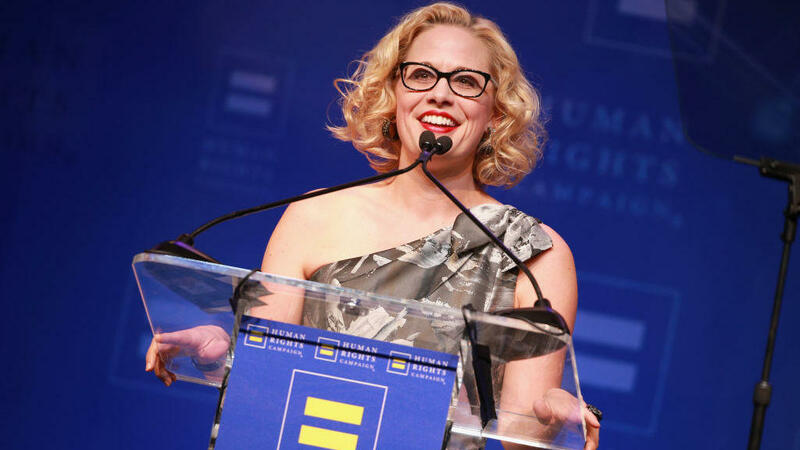 If elected, Arizona Congresswoman Kyrsten Sinema would become the first bisexual senator. Sinema is one of only six current LGBTQ lawmakers in the House. Half of them are running for higher office, but their numbers could likely grow next year. There will be at least 22 LGBTQ candidates on congressional ballots this fall, several in highly competitive districts that will determine control of the House. One of those candidates is Angie Craig, who's running in Minnesota's 2nd District in the suburbs of the Twin Cities. Craig would be the first lesbian mom ever to serve in Congress. ANGIE CRAIG: I'm so proud of my wife and our four sons. And, you know, I'm not running because, you know, I'd be the first lesbian mom, but that's pretty cool that I would be. TAYLOR: But her journey to become a mom is part of what drove her to run for office. When she and her then-partner were living in Tennessee and decided to adopt a baby, she was caught in a three-year legal battle after the birth mother's parents sued to challenge their fitness to raise a child. Today, her son Josh is 20. CRAIG: When you get up every single day for three years and you don't know whether you're going to be able to put your son to bed that night, certainly it makes you unafraid of anything. And I think when I'm running for Congress, I always remembered no matter how tough it gets, there'll never be anything more difficult than what I faced back in Tennessee. TAYLOR: That theme of struggle is one many LGBTQ candidates echo. Christine Hallquist made history when she won the Democratic gubernatorial nomination in Vermont. She's the first transgender person ever to win a major party's nomination for governor. In an interview with MORNING EDITION after her victory, Hallquist recalled how hard her transition had already been. CHRISTINE HALLQUIST: I dealt with not being authentic my whole life, and transitioning was clearly the hardest thing that I could ever imagine doing. TAYLOR: Hallquist is one of four LGBT Democratic nominees for governor running this cycle. In fact, they represent every part of that acronym. Lupe Valdez in Texas is lesbian. Congressman Jared Polis in Colorado is gay. Incumbent Oregon Governor Kate Brown - the first LGBTQ person ever to win a governor's race - is bisexual, and Hallquist is transgender. These Democrats are not just hoping for a blue wave this fall. They're hoping for a rainbow wave, too. Jessica Taylor, NPR News, Washington. (SOUNDBITE OF KINACK'S "HARD TRAVEL") Transcript provided by NPR, Copyright NPR.